What is exponential probability distribution? How to use the exponential distribution calculator? 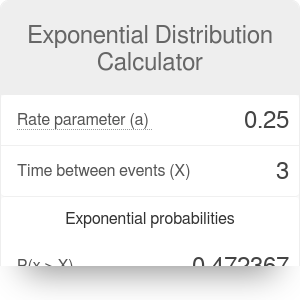 This exponential distribution calculator can help you determine the probability of a certain amount of time elapsing between two consecutive events. This article presents you with the definition and some examples of exponential distribution, as well as with the exponential distribution formula and an example of applying it in real life. Exponential distribution describes the time between events happening according to the Poisson distribution. It means that the events occur independently and at a constant average rate. Its key property is being memoryless. It means that, for example, the probability of an hour elapsing before the next bus comes to the bus stop is the same in the morning and in the evening. Also, the probability of a car engine breaking down during the next hour is the same during the first and hundredth hour of it running - we "forget" about the state of the car. Geometric distribution also has this property. You can simulate the exponential probability distribution using the SMp(x) function. While more versatile, it has more parameters, what makes it a bit more difficult to apply. Distance between two car accidents along a highway. exp denotes the exponential function. Let's assume you run a school cafeteria. The average number of clients is 15 students per hour. What is the probability that you will have to wait not more than 3 minutes for a client to appear? We will solve this problem step by step. Determine your base time interval. In this case, it will be most practical to use 1 minute as a time interval. Make sure that your rate parameter is expressed as 'per base time interval'. We need to convert 15 students per hour to 15 students per 60 minutes, or 1 student per 4 minutes. Hence, the rate parameter is a = 1/4. Determine the value of x. In this case, x is equal to 3 minutes. We want to calculate the value of P(x≤3). The probability of waiting less than 3 minutes is equal to 0.528, or 52.8%. If you want, you can also calculate the mean time between clients, the media, variance and standard deviation according to the formulas above. Make sure to check the results with the exponential distribution calculator! Exponential Distribution Calculator can be embedded on your website to enrich the content you wrote and make it easier for your visitors to understand your message.